What can Dr Dan’s products do for my Allergic Reactions? Dr. Dan’s Cortibalm and Dr Dan’s Hand and Body lotion are helpful in relieving the symptoms associated with contact dermatitis. The 1% hydrocortisone inhibits the release of histamines, bradykinins, and other chemicals that produce red, swollen, and itchy skin and lips. Allergies are hypersensitive reactions of the immune system. Allergic reactions range from mild to severe. For instance, they can be associated with runny nose, eczema, asthma, anaphylactic shock, and even death. Allergies result in an overproduction of the immunoglobulin IgE. Consequently, excessive activation of mast cells and basophils occur. These white cells contain packets of histamine that can produce hives, itching and redness. To reduce symptoms associated with these reactions, oral and topical steroids, antihistamines, and immunosuppressants are often used. 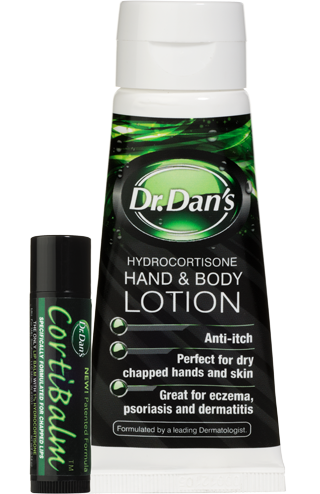 Dr Dan’s Cortibalm and Dr. Dan’s Hand Lotion both work to reduce the symptoms of itching, swelling and redness associated with allergic reactions. Routine application will help your lips and skin feel softer and smoother. Allergies are hypersensitive responses of the immune system. These responses occur when someone’s immune system responds to a substance in the environment that is recognized as “foreign”. This substance is known as an allergen, which produces an allergic response in the immune system. The response may be as mild as a sneeze or rash or as severe as anaphylactic shock, bronchoconstriction or even death. Most allergic responses are mild and result in the release of chemicals from cells that help to make up the immune system. These cells include lymphocytes, neutrophils, mast cells, eosinophils and macrophages. These cells contain chemicals such as histamines, bradykinins and hydrolytic enzymes that are released into your system when an allergic response occurs. Contact dermatitis is one of the most common allergic responses. When an individual’s skin comes in direct contact with an allergen such as poison ivy, the oil on the leaves produces an allergic response. As a result, cells containing chemicals are released that produce the raised, red, itching rash associated with poison ivy and similar plants. The easiest way to identify an allergy is by associating the allergen with the allergic response. In the case of poison ivy, this can be fairly straight forward. If you are aware of a recent contact with this plant and develop a rash, you are more than likely allergic to it. In some cases, finding the allergen, or the substance that you are allergic to, is more difficult. In these cases, going to an allergist and having skin testing performed, will help you identify your allergies. The most important part of treating allergies is to identify the substance you are allergic to and avoid it. If you do happen to develop and allergic reaction, the treatment is based on the type of reaction you have. Severe, life threatening reactions should be treated with the administration of epinephrine. Other symptoms may be treated appropriately with antihistamines, glucocorticoids, theophylline, decongestants and other medications.